I can no longer deny it. It's becoming just too obvious to hide. I must come out in the open with it. I know many will understand, but others will shake their heads and click their tongues with a little "tsk tsk". I've come to realize that many of the flowers I love and have become obsessed with are in the plant family Ranunculaceae. Clematis. Yes, I can't get enough of them, especially those with bell shaped blooms. Delphinium. I went through a few seasons trying to find one that would bloom reliably from year to year in my garden. My search continues. Helleborus. This is my latest obsession, now that H. niger 'Josef Lemper' is blooming in December in my garden. I repeat. Blooming. In December. In my garden. And don't forget Aquilegia, which many know as Columbine. I love when they are blooming in the spring. And of course the assorted Celandine cultivars. I have a few Brazen Husseys in pots, but need to get some other varieties again, as some of them didn't get through last Winter. I'm with you! I want lots and lots of hellebores! I have a similar obsession with the Mallow family in my hot Austin garden, though Ranunculus family is right behind it. I could probably do my entire yard with those two. Well, maybe three with Salvias added. Oh Blue Shed Thinking I have Brazen Hussy as well. I originally got it just for the name (who could resist??) but now love the little shiny yellow flowers above those browny-black leaves. One of my favorites! I planted a blue hellebore last year. It survived the summer and is making new leaves. Must join you in getting more. Indeed, the shortest night has yet to come, but we can be sure that eventually spring will come! Of course I meant the longest night. You are so right about hellebores. If you're looking for a book on them, try the one by C. Colston Burrell and Judith Knott Tyler pulished by Tmber Press in 2006. 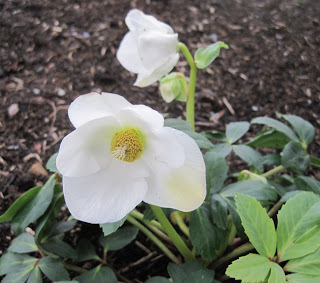 It's titled (appropriately) "Hellebores: A Comprehensive Guide."